Today is the start of Blaugust which means, among other things, a flurry of very short posts. There's no way I'm going to get one of my regular thousand-word epics up every single day for a month. Of course, the rules are much more lax this year. I don't have to post every day. But I'm going to try . It may mean a lot more news posts. Maybe some screenshot specials. The air may get a little thin at times. Fortunately this August is shaping up to be extremely busy in MMOdom. The return of the Festival of the Four Winds in GW2 was an early sighting of what I am guessing will be a whole flotilla of spoiler attempts by various developers, aiming to head off the mass defections that always accompany an imminent World of Warcraft expansion. From 12:01 AM PT on Tuesday, July 31, 2018 until 11:59 PM PT on Monday, August 6, 2018, members throughout Norrath will receive both double status and double currency! Plus, on live servers, all players will also earn double Planar Ethereal coins! If you're playing on a TLE server, you'll earn twice as many Hunter's Coins! Paired with the aforementioned double currency bonus, this means that members' Ethereal and Hunter's coin earnings will QUADRUPLE! This is the perfect time to work through that second wave of Ethereals! 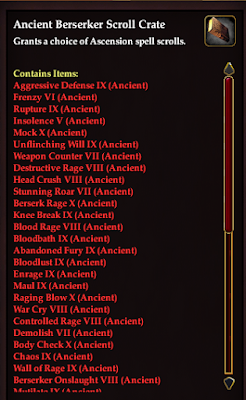 Double status is always a big deal in Norrath. 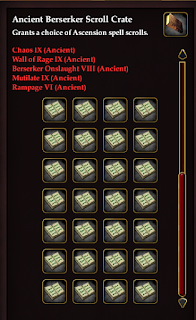 I just happen to have the Nebulous Newsies quests waiting on several characters for just such an opportunity, so that's my weekend sorted. 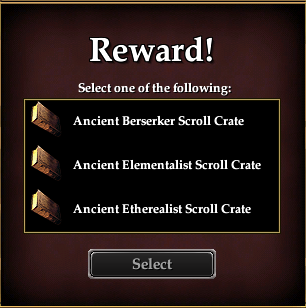 What's more, any and every Level 110 character that logs in between now and August 14th gets a free Ancient ability scroll. That's also big thing, trust me. There is a slight drawback. 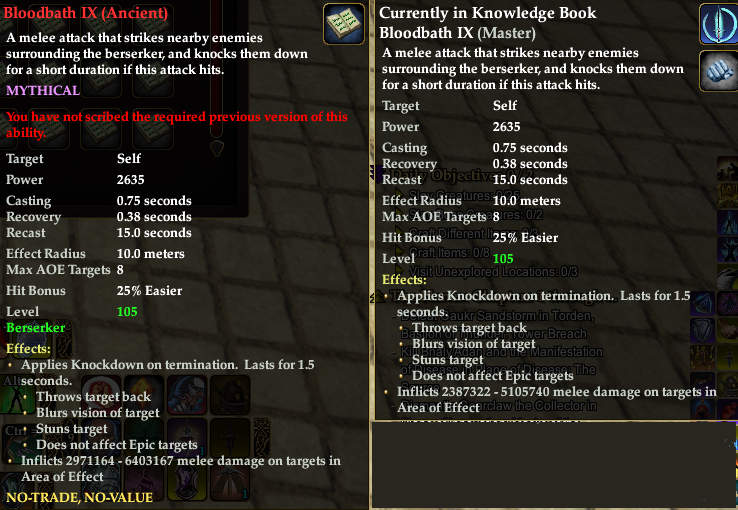 You have to have the spell or combat ability already in your book at Grandmaster level before you can use the scroll to upgrade it. 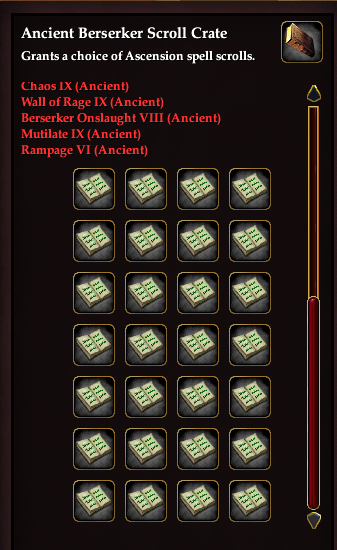 Even my best-geared character, the Berserker, doesn't have any Grandmaster abilities between level 101 and 110 yet. The rest are lucky if they even have any at Expert. He does have one at Master though and it's his absolute favorite. It's Bloodbath IX, the one where he spins around and does huge damage to everything around him in a 360 degree circle (as if there's any other kind). 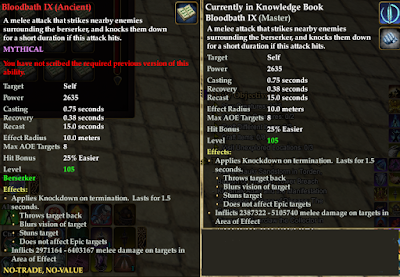 To upgrade that will take 55 days using the auto-upgrade system. It sounds like a long time but it's just a background training mechanic. The time soon passes. 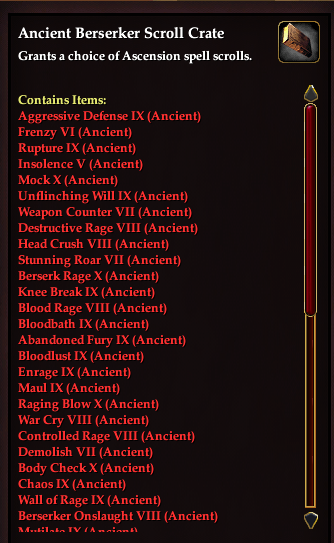 It means that he'll have his best (well, he loves it...) AE at Ancient by the time the next expansion arrives. Which is kind of exciting. If you have a max level character or one that could get there before the tenth of August, don't miss out on this great deal. Free is the best price you're going to get! (And I promise all the posts won't be as ugly as this one. All that red and black... reminds me of a GeoCities page from the 90s...). Oh Geocities... I remember them fondly... I won some sort of award for my StarCraft blog back then. Good times.